The SL54DD Midwest Solutions Double Door Giant Dog Crate is designed specifically to fit the largest dogs and now with TWO doors! 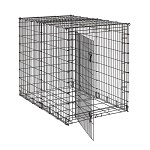 The SL54DD is a corner drop pin dog crate. Midwest Home for Pets is proud to introduce the newest dog crate in the Solutions Series. The SL54DD is the one of most convenient and affordable dog crates available for dogs over 125 lbs on the market today. It's made of durable materials and is easy to clean. Lastly, it has a safe & secure slide bolt latches for rigidity and comes with a tough easy to clean ABS Plastic Pan. Enter your Zipcode Code in field next to "Enter zip code to calculate shipping"
Want to continue with the purchase of the SL54DD Midwest Big Dog Crate contact us and tell us the product number SL54DD and your Zip Code and we will e-mail you a coupon code to save 10% off the shipping on this Giant Big Dog Crate. Please consider purchasing item "1154U+PAN" this is the Single Door Big Dog Crate with a Pan. The shipping is a little more reasonable than the Double Door Giant Dog Crate. We are offering this midwest GIANT dog crate + Divider Panel option at an incredibly low price due to UPS Shipping charge for this GIANT dog crate. Adding the Giant dog crate divider panel does not increase shipping cost. Note: The SL54DD Midwest Giant Dog Crate is an oversized product based on UPS Shipping Regulations. The freight charged for this product is the actual freight UPS charges for this product.